​No surprise that the first digital wave has focused on the flash of customer engagement and marketing. But attention is now turning to the heart of the business—back-office processes that offer opportunities to reinvent how daily work gets done—and harnessing emerging tech to build an enterprise ecosystem. For many in the business and tech worlds, the word digital conjures up thoughts of marketing, e-commerce, and omnichannel experiences that increasingly capture business mindshare (and investment). This is hardly surprising given that improving digital engagement with customers, patients, citizens, and business partners is now a defining mandate across industries and sectors. Though savvy organizations are approaching the digital mandate from a number of angles, one issue remains consistently important: the interconnectedness of front- and back-office systems. CIOs recognize that any effort to transform the front office won’t get far unless new digital systems have deep hooks into the core. These critical hooks make pricing, product availability, logistics, quality, financials, and other “heart of the business” information residing in the core available to sales and customer service operations. Creating connective tissue between enterprise functions and the core represents progress, but in terms of opportunity, it only scratches the surface. Here in the midst of the digital revolution, the core’s full potential remains largely untapped. Why? Because thus far, few organizations have extended the digital mandate beyond customer-facing functions to the middle and back offices. Expect this to change over the course of the next 18 to 24 months as CIOs, CFOs, and supply chain leaders begin developing new digital capabilities in their core systems. We’re not talking about deploying point solutions or shiny digital add-ons. Rather, this is about constructing a new core in which automation, analytics, real-time analysis and reporting, and interconnections are baked into systems and processes, fundamentally changing how work gets done. In many ways, the new core trend mirrors digitization efforts already under way in other enterprise functions, such as HR, sales, and marketing. Though their tactics and milestones certainly differ, all of these groups share a vision of enterprise functions as symbiotic building blocks in a larger ecosystem, working in concert to reshape business. After completing a few of these initiatives and the occasional one-off deployment of the latest digital tool, some companies began to feel core system fatigue, a situation exacerbated by the compounding complexity that eventually appears in aging mission-critical solutions. Meanwhile, CXOs and line-of-business leaders struggled to reconcile two seemingly contradictory realities: They recognized the shadow that technology’s rapid advancement was casting over their operations. At the same time, they were becoming ever more skeptical about one-off technology deployments. The new core flips these dimensions on their heads. As this trend gains momentum in the coming months, expect to see CXOs target core business areas such as finance and supply networks for meaningful change. Rather than focusing on discrete tasks or individual tools, they will be broadly exploring how digital technologies can support global ecosystems, platform economies, complex operational networks, and new ways of working in the future. That’s not to say the individual technologies are unimportant. They can be essential enablers for achieving an end vision. For example, blockchain’s distributed ledger offers a means for exchanging assets in an open, secure protocol, which has interesting implications for trade finance, supply chain validation processes, and other areas. Yet blockchain alone is only one component in a dynamic, interconnected new core stack. As companies begin their new core journeys, it will be critical to understand how digital innovations can work in concert with existing capabilities to drive business value. New core principles can be applied to all heart-of-the-business functions and processes. But to make the trend real, we are focusing on two areas with long histories of technology-enabled transformation: finance and supply chain. Agile and efficient. In the digital finance model, new product integrations and upgrades can be fast and effective. Public, private, or hybrid clouds offer a full stack of flexible, scalable “as-a-service” functionality without the large startup costs or technical debt associated with IT architecture and code maintenance. “Faster, cheaper, better.” Automation offers finance organizations opportunities to increase efficiencies and lower overall operating costs. Robotic process automation (RPA), for example, uses software programs to perform repetitive tasks and automate processes, such as procure-to-pay and order-to-cash. These processes often involve numerous manual activities, including data entry and reports. Information accessibility. Planners and analysts can “see” developing trends and circumstances that directly impact decision-making. Predictive algorithms feeding visualization technologies translate the kinds of information and insights that have traditionally been the domain of data scientists into understandable visual metrics that workers across the enterprise can leverage. Over time, CFO and COO data and insights may converge, enabling more seamless oversight, planning, and decision-making. Automated insights in real time. The term cognitive computing describes an array of technologies including machine learning, natural language processing, speech recognition, computer vision, and artificial intelligence. Taken together, these tools simulate human cognitive skills, grinding through mountains of data to automate insights and reporting in real time. Super-sized data management capacity. To manage digital information effectively, finance organizations will likely need a technical architecture that can handle massive data sets, without sacrificing availability, timeliness, or the quality of “books and records.” This is what in-memory technology provides. Its key applications include transaction processing, event processing, distributed caching, and scenario modeling. Digital trust. As discussed in previous editions of Tech Trends,6 in the digital economy, financial and legal transactions that involve third-party intermediaries such as a bank or credit agency may be replaced by person-to-person transactions that do not require traditional trust mechanisms. Instead, parties to a transaction will create digital identities that verify their trustworthiness and store these identities in a blockchain where others can access but not alter them. Similarly, digital identities will be essential trust elements in blockchain-based digital contracts. Though currently not binding in a legal sense, “smart contracts” represent a next step in the progression of blockchain from a financial transaction protocol to an all-purpose utility. Even with digital technologies maturing and use cases emerging in other enterprise domains, new core digital finance initiatives are still relatively rare. Data discipline remains a challenge in many companies. Likewise, historically, decision-makers have not viewed finance organizations as particularly rich targets for achievable savings. Yet there are a few pioneering companies that are developing digital finance capabilities in a concerted way. Others are experimenting with specific tools, such as RPA. Though these experiments may take place within the context of a larger roadmap, they may not represent a holistic embrace of the new core trend. But in the end, these early efforts can give pioneers a competitive advantage as the trend picks up steam. Pfizer Inc. is one of the largest global pharma organizations in the world, with operations in more than 180 countries. With an operation of that size and scale, the finance function is not a back-office consideration but, rather, a vital part of the overall operation. Given its importance, Pfizer’s finance organization has always sought to be at the forefront of embracing technology as an enabler to help drive the business. The journey began several years ago, when the overall enterprise began migrating to a centralized ERP platform. The move to a common global ERP helped to standardize processes and enabled a significant move to global shared services and centers of excellence; it also allowed finance business partners to focus on driving analytics and business insights with the broader enterprise. Now that 95 percent of Pfizer’s revenue is running on its ERP platform, taking advantage of emerging digital technologies was the natural next step in its journey. While the view of digital was not different, the approach for evaluating and deploying it was. According to DeBartolo, it was important for Pfizer’s finance leadership to understand which digital technologies were ready now and which tools were still emerging and might have an impact in the future. As a result, finance leaders decided to take a “rapid rolling” model, which allowed the function to quickly pilot digital tools and understand their functionality and relevance before rolling them out. In this model, the company’s combined finance and business technology team began exploring and implementing tools differently and more rapidly than ever before. The team started with pilots in several of the more mature solutions, RPA, predictive analytics and data visualization. They piloted the technology in four processes that could quickly demonstrate measurable ROI—wholesaler chargebacks (order-to-cash), accounts payable, management reporting, and intercompany reconciliations—and could help leadership understand the value of the tools and how best to deploy them. In certain pilots, the RPA automated between 30 and 80 percent of the in-scope tasks, including running reports, populating spreadsheets, uploading data to the server, and sending emails. As a result of the pilots, leaders have signed on, putting active programs in place to significantly deploy RPA and predictive analytics more broadly, with an attractive, accelerated payback. Moreover, some of the savings generated by the RPA pilot will be used to fund future digital finance pilots. From the lessons learned in the first two pilot areas, Pfizer has created a roadmap to pilot other tools, including blockchain, natural language generation, and cognitive computing. Collectively, the capabilities represent the opportunity to further improve how finance supports the business. For example, by developing predictive models for commercial forecasting, finance can provide additional insights on revenue, patient populations, and proactive risk detection, rather than focusing on manual efforts to calculate and assemble the information for assessment. The digital revolution is driving profound change in every core function, but perhaps none more so than in the supply chain. Traditionally, organizations have structured their supply chains to support a linear progression of planning, sourcing, manufacturing, and delivering goods. For each of these functions and their dependencies, supply chains enabled large numbers of transactions involving the exchange of time, money, data, or physical materials for some other unit of value. Always-on agility and transparency. Securely and in real time, DSNs integrate traditional datasets with data from sensors and location technologies. This provides visibility into all aspects of the supply network, making it possible to dynamically track material flows, synchronize schedules, balance supply with demand, and drive efficiencies. It also enables rapid, no-latency responses to changing network conditions and unforeseen disruptions. Connected community. DSNs allow multiple stakeholders—suppliers, partners, customers, products, and assets, among others—to communicate and share data and information directly, rather than through a gatekeeper. Being connected in this way allows for greater data synchronicity, ensuring that stakeholders are all working with the same data when making decisions. It also makes it possible for machines to make some operating decisions. Intelligent optimization. By connecting humans, machines, and analytics (both data-driven and predictive), DSNs create a closed loop of learning, which supports on-the-spot human-machine decision-making. What’s more, through analytics, DSNs put data to work solving challenges in targeted areas such as commodity volatility, demand forecasting, and supplier-specific issues. Holistic decision-making. When all supply chain processes become more transparent, the net result can be greater visibility, performance optimization, goal setting, and fact-based decision-making. This enables complex decisions to be made more quickly and with an understanding of the trade-offs involved, thus avoiding sub-optimization. Likewise, companies are already using these insights to reimagine the way they design, manufacture, and deliver products to customers, with tremendous implications for the supply chain. In retail, for example, omnichannel customer experiences rely first and foremost on inventory visibility. When purchasing an item online, a customer wants to know if the item is available and, if not, when it will be. For some retailers, answering this question quickly and accurately is not always easy. In traditional supply chains, information travels linearly, with each function dependent on the one before it. Inefficiencies in one step can result in a cascade of similar inefficiencies in subsequent stages. In some companies, supply chain stakeholders have little if any visibility into other processes, which limits their ability to react or adjust their activities. With the DSN model, all steps are interconnected, creating a unified digital network that gives supply chain managers a real-time view of all process steps, from design to manufacture to delivery. Back-office and operational functions are no strangers to the digital revolution. In fact, countless finance and supply organizations deploy some digital tools and are likely exploring other digital opportunities. But because the new core trend involves transformation on a much larger and fundamental scale, it might be useful to correct a few misconceptions that digital dabblers may have about the journey ahead. Misconception: I’m better off waiting for my ERP vendor to offer cognitive tools specifically designed for the finance and supply chain modules I’m running. Reality: The cognitive market is already showing signs of consolidating. Big enterprise software and cloud vendors are selecting cognitive tools and incorporating them into their products. In the future, small companies currently driving much of the innovation in the cognitive space likely will either be swallowed up or find a niche trajectory to follow independently. You can’t afford to wait for the market to sort itself out. Your competition is already kicking the tires on existing products and laying the groundwork for a digital future. Misconception: I have a robust finance system that allows me to see all numbers and processes in gory detail. What’s more, there’s very little latency. Why would I want to automate? Reality: We would venture a guess that many of the dedicated finance team members who think they are performing analysis are, in reality, trying to protect the predictability of earnings forecasts. CFOs can unburden these underused workers by using machine learning tools to automate the planning and forecasting processes. This can free finance talent to focus on generating real business insights. There is a bigger automation picture to consider. Chances are other enterprise groups are already exploring automation opportunities. Though domain-specific automation initiatives can drive discrete efficiencies, in the near future, companies may be able to maximize automation’s impact by applying it consistently across HR, supply chain, finance, and other enterprise domains. Automation—with RPA, cognitive, and other dedicated tools—represents the future. Misconception: Staff members in my finance organization are top-notch. They should have no problem with new digital systems and processes. Reality: No doubt your workers are top-notch. But remember: The skills needed to operate finance and supply chains in a digital world are very different from traditional accounting and logistics skills. Some staff members will make the transition to more digital roles; others may not. As you think about your talent model, how will you help current employees upskill? Likewise, how will you recruit in-demand digital veterans who can pick and choose from any number of job offers? As you embrace the new core trend, don’t underestimate the importance of recruiting the right talent—every hire you make is an opportunity to prepare for a digital future. As we automate, digitize, and integrate functions in areas such as supply chain and finance, attack surfaces expand and new risk considerations arise. However, digitizing the core can enable greater transparency, real-time communication, and faster response times, facilitating increasingly sophisticated risk management tactics that can protect an organization’s operations and assets. While digitizing legacy supply chains can streamline processes and improve transparency, it also can create huge data stores with multiple points of vulnerability. The risks around data encryption and confidentiality are still a concern: It is critical to protect data, both at rest and in transit, as well as in memory. The use of open APIs can increase your network’s vulnerabilities; management of API-specific identities, access, data encryption, confidentiality, and security logging and monitoring controls are essential. The risks of a traditional supply chain—counterfeiting, malicious modifications, threats to intellectual property—still apply in a digital supply network, while the digital footprint also requires securing the flow of intellectual property. In terms of data stewardship, organizations should thoroughly inventory the data moving through their supply chains. Determine who will monitor and manage data at each point, as well as who owns detection and response if there is a breach. Identify the core privacy and security requirements that need to be fulfilled, and who will own the tracking and auditing for these at each node. Finally, put in place validation, review, and update mechanisms once the digital supply chain is operational. Monitor and surveil bots and cognitive systems. An organization needs to verify a bot is acting as designed and intended. For instance, if a system with only read access were able to gain write access, it could change data in the general ledger. Carefully vet third-party capabilities and continuously monitor black box solutions. Third-party solutions can impose risks—from an initial vendor proof of concept to adhering to ongoing requirements. Further, “black box” solutions can pose significant infrastructure risk once given access to systems, processes, or data. Customize approaches to validation and testing. Traditional periodic, point-in-time compliance testing and oversight may no longer be sufficient for cognitive technologies. Escalate the importance of preventive and automated controls.Before cognitive solutions go live, they should undergo rigorous review boards, pre-authorization clearances, and impact analyses. 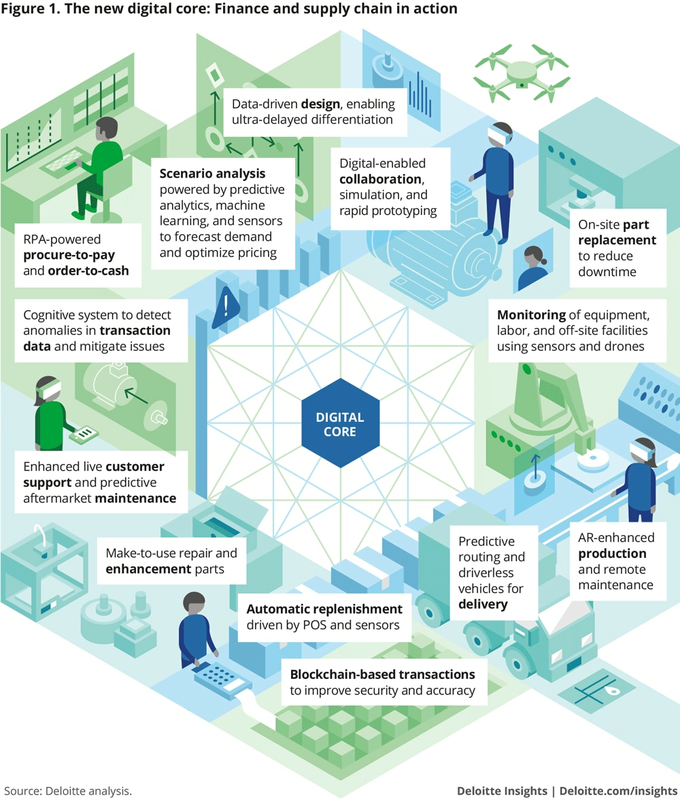 Business process automation in both the digitized supply chain and finance functions—including robotics, cognitive engines, natural language processing, and blockchain-related technologies—offers opportunities for a more robust risk management strategy. It can reduce the propensity for human error and make tracking, monitoring, detecting, and responding faster, more consistent, and smarter. While risks are inherent in the implementation of any new technology, the modern core is helping enable more efficient, thorough, and intelligent risk strategies to protect two of the most critical areas in any organization—supply chain and finance. Around the globe, organizations increasingly recognize the value that the new core trend can offer. 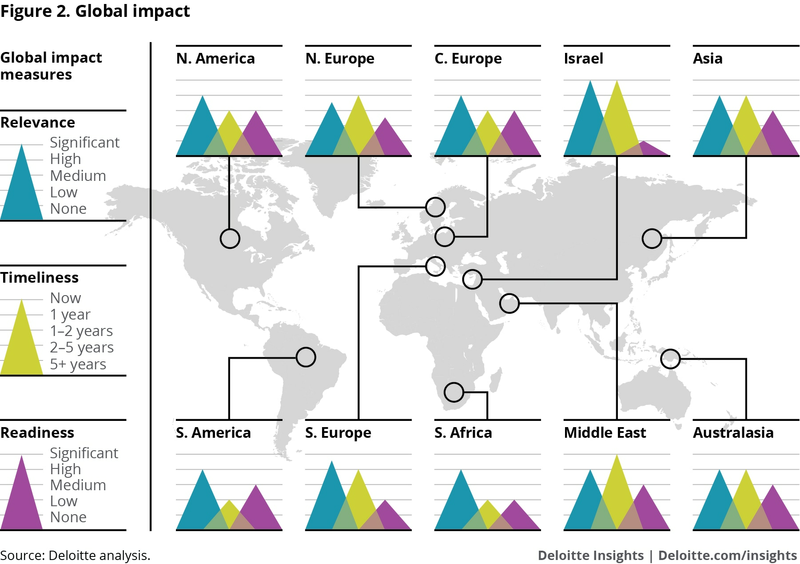 According to findings from a recent survey of Deloitte leaders across 10 regions, the new core is gaining traction as an effective means for framing broader digital transformation agendas. These agendas often include, among others, core ERP upgrades, and deployments of disruptive technologies, such as cognitive, robotics, and IoT. Survey responses suggest that new core timelines vary greatly among regions. For example, countries with industries that adopted large-scale ERP or custom system deployments early on—the United Kingdom, the United States, Canada, and Germany, for example—are becoming the new core pioneers. Countries with industries that embraced large-scale ERP later are at a different stage transitioning from “acknowledge need” to formal efforts to develop actionable plans—for example, financial services in Brazil, Mexico, Asia Pacific, and the Middle East. Other factors also account for regional variations in adoption timelines. In Latin America and South Africa, for example, companies are more likely to focus on customer-facing transformation activities. Survey respondents report that companies in these regions are linking digital capabilities to ERP and other back- and mid-office systems. However, few have launched large-scale transformation projects. Across the globe, there are consistent readiness challenges. Survey respondents report significant concerns over the potential impact that new core initiatives could have on company culture, talent, and organizational structures. The cost and complexity of maintaining existing systems also contribute to lack of readiness. Finally, many technology leaders worldwide struggle to develop an architectural vision to guide various facets of core modernization. Just as looking beyond individual domains’ boundaries unlocks the underlying technologies’ full potential, the new core gets even more interesting when the lines between core functions start to blur. The same digital backbone needed for an automated financial close could allow dynamic scheduling of outbound delivery to prioritize order flow. IoT-empowered quality control metrics from the supply chain or embedded in products could allow dynamic, real-time visibility into actual selling, general, and administrative expenses—and trigger pricing and promotions based on fluctuating product availability or performance issues of a customer’s previous purchases. Creating a new core is neither a marathon nor a sprint—rather, it’s a series of sprints toward an overall destination. As you begin exploring digital possibilities, the following initial steps can help you get off to a good start. Learn from others. If you haven’t already, create a small cross-functional team to help you understand the trend’s possibilities. Also, chances are, some of your peers in other parts of the company are already leading digital initiatives. Don’t reinvent the wheel—there is a lot you can learn from their experiences. Talk to your colleagues. Find out how transformation has reshaped their talent and operating models, and learn from successes they’ve had—and from their failures. Make a plan. Map out a transformation plan for your function, focusing first on applications that have proven to be clear winners in other finance or supply chain organizations. This can serve as a master blueprint, but remember to execute it one step at a time. Things are changing fast in the digital world. Try to avoid making big bets until you know you are ready and you fully understand the potential risks. Don’t just imagine tomorrow—get there from today. Before committing to bold visions of digital grandeur, consider the hardest part of the equation: Where do your people, organizational structure, processes, and technology fit in this brave new world? Many established assets can serve as building blocks for the new core. But make sure any modernization needs are well understood before provisioning budget and locking down milestones. Don’t limit the reality check to your “legacy,” either. For emerging and new technologies, you will likely have to move beyond the rhetoric of what’s real today, the path to enterprise scale and controls, and the pace of advancement. Build confidence in the when to invest, not just the where and the what. Start cleaning up your use case data. Data is the lifeblood of the digital core—and a potential source of trouble in any new core initiative. In many companies, the data needed for use cases is siloed and rife with misspellings, duplicate records, and inaccuracies. Consider creating a cognitive data steward to automate the tedious process of examining problematic data and resolving issues. Also, be more proactive in the way you manage use case data. Adding metadata can enhance data context. Greater context, in turn, can help organizations group and process thematically similar information more efficiently, as well as enable increased process automation. Most boardrooms lack the appetite to fund (or the patience to weather) expansive transformation agendas. This is especially true when the agendas in question focus on back-office institutional processes. Be that as it may, digital’s disruptive march across the enterprise continues apace. Fueled by digital innovation, the new core trend presents a host of potentially valuable opportunities to redefine heart-of-the-business work and establish a better foundation for customer-facing innovation and growth initiatives. Bill Briggs is US chief technology officer of Deloitte Consulting LLP, based in Kansas City, Mo. Steven Ehrenhalt is a principal with Deloitte Consulting LLP and is based in Miami. Doug Gish leads Deloitte Consulting LLP’s Supply Chain and Manufacturing Operations and is based in Kansas City, Mo. Nidal Haddad is a principal with Deloitte Consulting LLP, based in Chicago. Adam Mussomeli is a principal with Deloitte Consulting LLP and is based in Stamford, Conn.
Anton Sher is a principal with Deloitte Consulting LLP, based in Los Angeles. Vivek (Vic) Katyal is the Global and US Risk Analytics leader with Deloitte and Touche LLP and is based in Minneapolis.